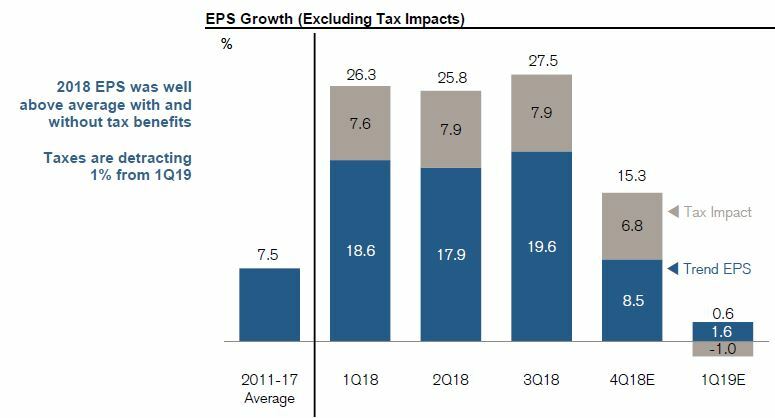 Tax law changes boosted corporate earnings in 2018, and now taxes could take away from profit growth in 2019. One of those would be Apple, at the top of the list with profit growth of 40.6 percent in the third quarter, and now expected to see a decline of 12.3 percent in the first quarter. Another reversal was Alphabet, with profits up 23.9 percent in the third quarter but a decline of 21 percent expected in the first quarter. 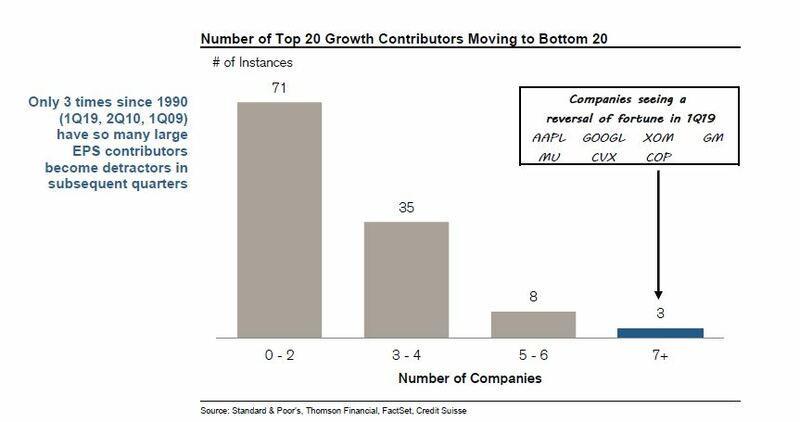 Both have gone from the top 20 S&P 500 companies in terms of growth to the bottom 20 percent. “For the typical company, are they seeing a problem? The answer is not really. You can get a few bad apples distort the underlying trend,” said Patrick Palfrey, U.S. equities strategist at Credit Suisse. Palfrey said many companies could be growing at 5 percent to 6 percent, above the trend of very low single digits. Palfrey said the tax changes became a drag because in 2018, the tax impact included benefits that are now unavailable , like a deduction for capital expenditures. “We’re cycling against tax benefits and taxes actually become a headwind in 2019. where as in 2018 we benefited 7 to 8 percent. I think the expectation was taxes aren’t going to be a factor. What we found is the tax rate is going to bump up incrementally in 2019 and subtract 1 percent from growth,” he said. Refinitiv expects S&P 500 earnings to grow by 0.3 percent in the first quarter, down from the more than 23 percent growth across the past year. The growth rate for 2019 is expected to be just 4.5 percent. Palfrey tracks the biggest growth companies and says there’s an unusually high number that have fallen from the top ranks of earnings growth to the bottom 20. There are now seven companies, including Alphabet and Apple. The others are Exxon Mobil, GM, Micron, Chevron, and ConocoPhillips that have suddenly fallen form the top to the bottom ranks. That many companies have only had a ‘reversal of fortune’ three times since 1990. A much more common level of ‘reversals” is one to two a quarter, and that has been the pace in 71 quarters. In 35 quarters since 1990, there were three to four that fell from the top 20 to bottom 20. As oil prices swung wildly last year, Exxon went from earnings growth of 51 percent in the third quarter, to a decline of 14.5 percent expected for the first quarter. It had the sixth fastest earnings growth rate of the S&P 500 in the third quarter. Other energy companies like Chevron had a similar experience. Chevron earnings rose 148 percent in the third quarter, but are forecast to fall by 21 percent in the first quarter. “We actually see the market doing pretty well in 2019,” Palfrey said. Credit Suisse sees many earnings revisions as fairly normal, but Apple and big oil stand out as having a bigger impact. “There is this massive skew for these mega cap companies that had really great years, over the past several years and in 2019, the trends are uninspiring for them,” Palfrey said.